Blended learning, also referred to as hybrid and mixed-mode instruction, lacks a unified definition. AUC defines blended learning as a combination of face-to-face and online instruction. It entails replacing a percentage of class time (between 20 percent and 50 percent) with online instruction. The percentage of online versus face-to-face instruction varies according to context. How Does Blended Learning Differ From Online and Web-Enhanced Learning? In online learning, students do not meet face-to-face for instructional purposes, however, they might meet in person for orientation or assessment. On the other hand, in web-enhanced learning students meet face-to-face 100 percent of the time and the online component does not replace face-to-face meetings. Internet-based tasks and assignments are used as supplementary to class instruction. As for blended learning, online activities and interaction become integral to the learning and teaching process. Should I Blend or Not? Many faculty members struggle with the idea of whether blending is the suitable for their courses. 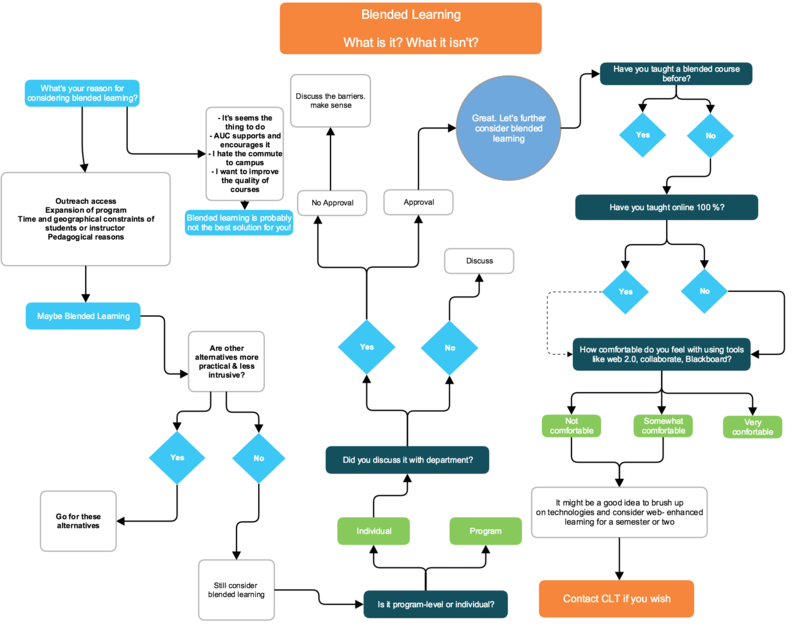 Follow this decision tree to guide you with exploring your options for blending. In 2013, the BL task force identified the following goals for BL at AUC as shown in this document.